Anglers who are familiar with the great success of the Reaction Innovations Sweet Beaver know that the design of the Beavers is a real fish catcher. The forward facing ribs create lots of water movement and vibration calling the attention of any bass in the area, and the twin tails facing 90 degrees from each other will provide movement no matter which way the bait is moved. Now, Reaction Innovations has created a smaller version called the Smallie Beaver for those times when you need to downsize for the largemouth and already the perfect size for the smallmouth. 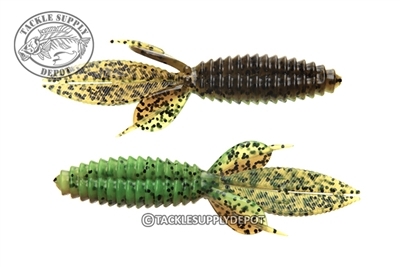 Whether rigging on the back of a finesse jig, drag on an open hook ball head or Texas rig and flip into cover, the Smallie Beaver gives a bite size appeal that is ideal for many situations.